Boyd Gilbert was a Model A guy long before they became highly prized by collectors and hot-rodders alike. Boyd’s personal history goes back to the 1950s when a Model A was simply a really cheap used car. Back then he and his buddies would pack a case of beer, head off for a duck hunt and flip for the rumble seat-the prime time open-air box seat for bringing down Daffy and his unlucky duck cousins. 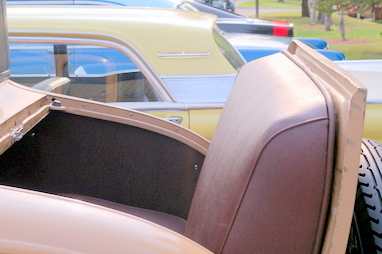 Using a rumble seat like a gun turret after a few beers was probably not the safest scenario but that was the charm of the 50s-people took a few chances and lived to talk about it. The nanny state came later. 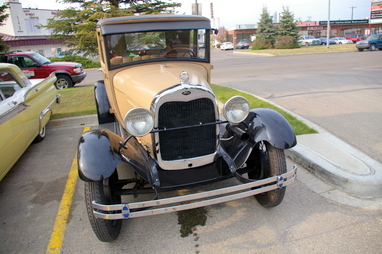 Boyd never lost his affection for the tough old Fords and as luck would have it he finally bought one this year. This is a very solid driver and Boyd is having a great time working on the little details. He drives this Henry Ford legend with very few worries in modern traffic. As he says “the brakes work on all 4 wheels and it shifts like a dream”. Boyd also owns a Model T so this statement isn’t a shocker-the T is quite a bit more primitive. His only nod to the 21st Century is a working set of signal lights but after that the modern day options disappear. The one option that really counts came with the car-the rumble seat.